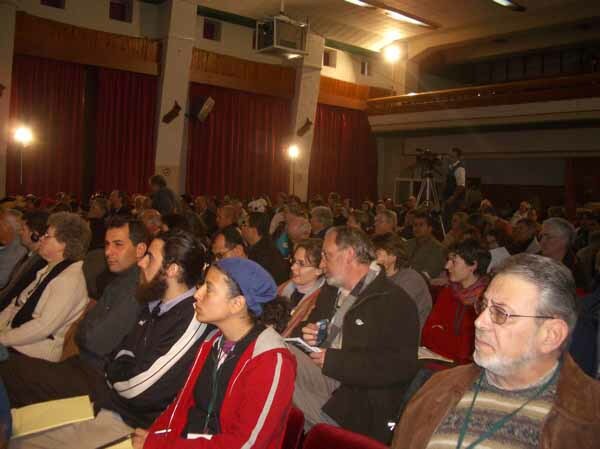 December 29, 2005, 8am BST - Yesterday the conference focused on the Palestinian Nonviolent Movement. For me, Mubarak Awad's speech was the highlight. Awad is a well-known Palestinian activist who founded the Palestinian Center for the Study of Nonviolence in the early 1980s in East Jerusalem, and was deported to the US for his role in organizing the first Intifada, a largely nonviolent uprising started in 1987. Awad is currently a director of Nonviolence International in DC. Awad called for Palestinians to escalate their commitment to nonviolence. He reiterated his proposal for the refugees to burn their camps to the ground and march back to their villages. UN Resolutions have affirmed the right of the refugees to return, and Awad said it is time for the Palestinian people to stop waiting for Israel or the international community to deliver on its obligations. He also told a story about a Palestinian woman who was suffering from Israelis dumping their garbage on her property, so after petitioning the Israelis to stop and seeking legal recourse to no avail, she stood in front of the garbage truck and would not back down. This is true nonviolence. Dr. Mustafa Barghouti, a presidential candidate in the January 2005 elections, explained how the 1970s were a critical period for the Palestinians. Volunteerism and building of professional associations laid the groundwork for the first Intifada. He reported that Palestinians are the only people seriously implementing democratic and governance reforms while under military occupation. Dr. Hind Khoury, Minister of State for Jerusalem Affairs of the Palestinian Authority, discussed the debate about nonviolence. She affirmed that it is the Palestinian people's right to resist the occupation but that they need to decide what is the most effective way to do so. She alluded to a theme that came up throughout the day: the tension and debate in Palestinian society about what form of resistance to utilize and why. Another speaker reported that for most Palestinians, nonviolence is a strategic or pragmatic decision (as advocated by Gene Sharp of the Albert Einstein Institute), not a principled or moral commitment (as with Gandhi or MLK Jr.). I attended a workshop entitled "Nonviolence within Palestinian society." An interesting discussion took place between an Israeli activist and the Palestinian facilitator, Mr. Zoughbi Zoughbi. They ended up in a debate about who was not doing enough to condemn violence, the Palestinian peace movement or the Israeli. It highlighted issues of power, privilege, and the importance of using compassion to achieve heart unity, even if (unfortunately) it was in short supply in the heat of the moment during this particular conversation. During the afternoon panels, various Palestinian religious leaders discussed nonviolence. The Christian Leaders were clear about Jesus' commitment. 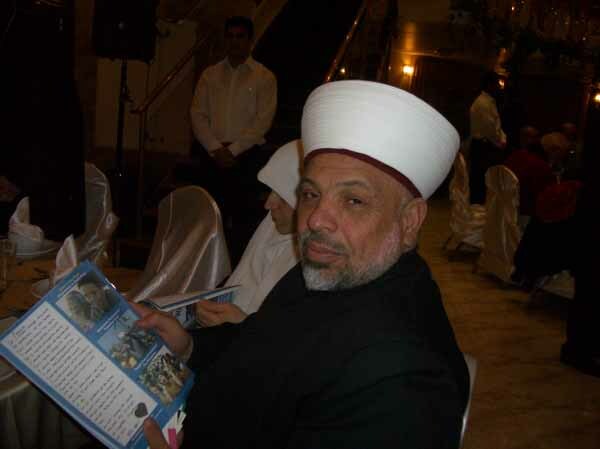 Sheikh Tayser Tamimi (featured in this photograph, reading the latest print issue of PeacePower) refused to condemn violence due to (according to other Palestinians) that to do so could be interpreted as a sign of weakness, and instead focused on the injustices of the Israeli occupation and the importance of the nonviolence resistance. I personally witnessed the Sheikh leading a protest at Bil'in and although I do not speak Arabic, it seemed to me that he conducted the march with complete dignity, leading afternoon prayers at the site of the wall that would confiscate Palestinian land. 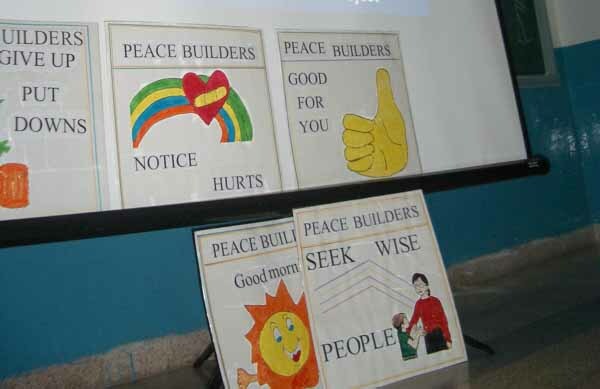 In the afternoon, Sis Levin presented a workshop on the Peacebuilders program, an educational initiative in Bethlehem teaching peace culture to students of all levels, K through University. Sis stated she's received feedback such as, "If Germany has this kind of educational system, Hitler never would have come to power." In the evening, the Terra Sancta school for girls performed "Our diaries through the wall," a moving dance and theatre piece on what life behind the wall is truly like. · A profile of Windows, an ngo that brings together Palestinian and Israeli youths and publishes a joint magazine. Just setting up a meeting proved difficult due to the cosntant road closures imposed by the illegal military occupation. We also saw an hour-long documentary on the International Solidarity Movement (ISM) campaign in Palestine to support the nonviolent resistance. Founded by Palestinians, ISM approaches resistance from a strategic standpoint and helps create space for Palestinians to conduct their resistance. This partisan mission has also resulted in a controversial status among Israeli Jews. This is in contrast to organizations such as Christian Peacemaker Teams (CPT) whose mission is to get in the way of all violence, whether directed at Israelis or Palestinians. Jerry Levin tells me that during the siege of the Church of the Nativity, CPT-ers walked brazenly in the middle of what had become a battlefield to reduce tensions. In Hebron, a CPT-er friend of Jerry was grocery shopping in Hebron during an exchange of stone throwing and tear gas. He walked in the middle of the street and it all stopped. During a presentation on "Geopolitical Realities," Palestinian legal advisor to the PA negotiations team Gregory N. Khalil described a depressing reality: with each passing year, the two-state solution is being rendered more impossible by facts being created on the ground. He explained that Israel's "apartheid wall" and continued land confiscation is reducing the west bank to a series of territorially disconnected ghettoes ("Bantustans"). Khalil maintains that the "historic compromise" Palestinian leaders agreed to of a state within the 1967 borders cannot be achieved because a large amount of the West Bank has been confiscated. Khalil also highlighted the extreme pro-Israel bias of Western media; for instance, he claims that Steve Erlinger of the New York Times has described Israeli settlements (illegal under International law) as "neighborhoods" of Jerusalem, implying legitimacy. Khalil mentioned the importance of the international community supporting open access to Gaza (airspace, seaspace, movement of people and goods) and respect for international law (including the International Court of Justice's ruling that the wall is illegal). Khalil stated that the Palestinian Authority has no plans at this time to engage in any form of mass nonviolent struggle. The PA endoreses it, but does not work to organize the kind of resistance the Bil'in villagers are engaged in (see this article). In the evening, we heard a number of speeches by Palestinian figures. Sami Awad asked everyone to remember the sacrifices of the Palestinian people, including Father Ibrahim Ayyad, a co-founder of Holy Land Trust (organizer of the conference). Mubarak Awad called on all conference participants to respect each other's experiences in nonviolence. The Governor of Bethlehem, Salah Tamari, related a powerful story about how as a young man, engaged in the armed struggle, he had his sniper rifle trained on an Israeli soldier, his finger clenched at a trigger. When the Israeli turned and looked at one of Tamari's favorite trees, Tamari found himself unable to fire the gun. The Governor said that it took far more courage not to fire the gun than it would have taken to give in to his rage and frustration. Echoing Gandhi's discussion of transmuting negative drives, Tamari referred to this as "channeling" anger for positive effect. President Carter, UN Secretary Generarl Kofi Annan, and S. Africa Archbishop Desmond Tutu passed along words of support through various representatives. President Abbas did not show up. What if President Abbas Addressed the Knesset? I'm praying for the people of the Holy Land "to discover each other's humanity through nonviolence" as Michael Nagler put it. The conference will feature some high-profile speakers (including Palestinian President Mahmoud Abbas) and many luminaries from the field of nonviolence. Apparently, the parents of Rachel Corrie will be in attendance, and I hope to meet them to offer appreciation. I was just reflecting on an Israeli politician's comment to me last summer that for the Arab Peace Initiative (also known as the Saudi Peace Proposal) to be taken seriously, it would require those making the proposal to come to the Knesset and speak as Pres. Anwar Sadat of Egypt did in 1977. I wonder if President Abbas has considered this idea? It seems to me that Israelis need to hear in a convincing and persuasive way that the Palestinians want to be their neighbors. Israelis need to find (and are perhaps privately searching for) a way to rehumanize the Palestinians in their minds. Nonviolent action could catalyze this shift, but if a carefully considered speech by the right person in the right setting could help, then why not? And if all the Arab leaders join Abbas, better yet, because Israelis crave recognition from the entire region, not just the Palestinians. A point of no return (or something like it) may be fast approaching in this conflict. If the wall is completed, and the West Bank is turned into territorially disconnected ghettoes, I fear that the level of frustration and hopelessness in Palestinian society will only rise. No one will benefit from such a situation, not the Palestinians, not the Israelis, and not the world. The time to extend hands and olive branches is now. The Arab Peace Initiative of 2003 offered a comprehensive peace treaty and full diplomatic reognition of Israel in exchange for a return to the 1967 borders (any changes to be mutually agreed upon) and a "just" resolution to the refugee crisis (to be mutually agreed). Read the BBC News analysis.